Healthy Families America (HFA) provides substantial interaction with parents and children, creating healthy relationships and positive collaboration from prenatal to five years of age. HFA is designed for parents facing a variety of challenges, such as single parenthood; low income; childhood history of abuse and other adverse child experiences; and current or previous issues related to substance abuse, mental health issues, and/or domestic violence. The goal of Healthy Families America is to positively impact the wellbeing of mothers, children, and their families early on, and further maintain a loving, self-sufficient future. In 2016/2017 budget year, Healthy Families America affiliations in Wisconsin provided care to 795 families at 14 different sites, resulting in over 13,100 visits. 64% of services were given to parents regardless of parenting experience, and 36% were given to first time parents. HFA has multiple program locations across the state of Wisconsin to bring you the most accessible resources possible. 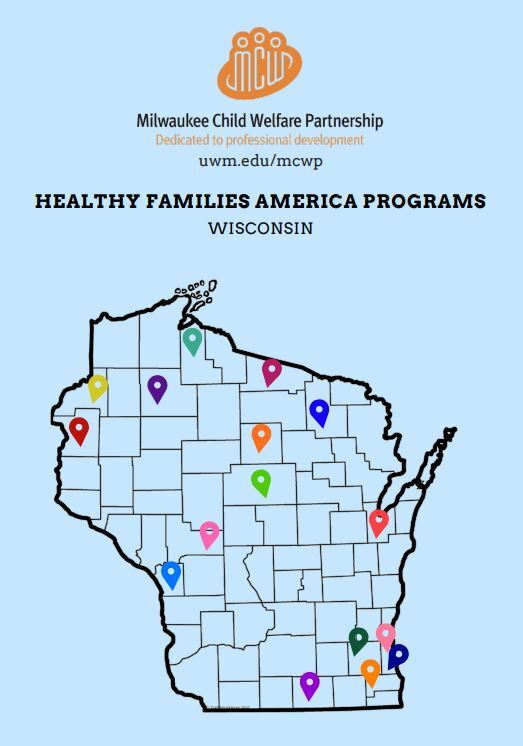 Please refer to our Healthy Families America Programs Guide for a list of affiliations across Wisconsin and how to contact them. For more information relating to the national HFA calendar, programs, or further involvement, please refer to the national Healthy Families America website. The Milwaukee Child Welfare Partnership’s Home Visiting Program offers Healthy Families America trainings throughout the year in various locations around Wisconsin. View the Home Visiting Training Calendar for the list of sessions and locations in Wisconsin. Please visit the national Healthy Families America website for additional national trainings. The Resource Toolkit for Home Visiting and other Early Childhood Professionals contains articles, webinars, websites, books and face-to-face training opportunities on a variety of topics including adverse childhood experiences, child development, maternal health, child health and safety, parenting, and skills for working with families. The national Healthy Families America website also has useful resources.